marital bless: So many titles to choose from. Confused? I figured as much. Tony and I planned on celebrating the 4th first by attending a family reunion for his Dad's side, followed by a gathering of friends before fireworks. What actually happened? 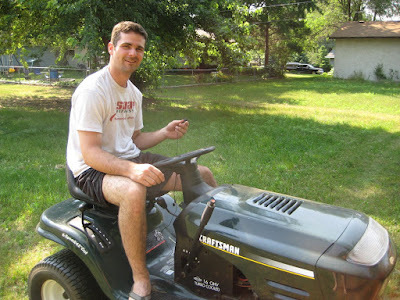 The timing was wrong for the family reunion, we thought it started with food at 11:00, while food was not happening until 4:00 . . . soooo Tony decided to mow the lawn quick. During which he broke both our riding lawn mower and our push mower. Yay! Not. So he came inside and vented to me, as I was in the process of remedying the situation. 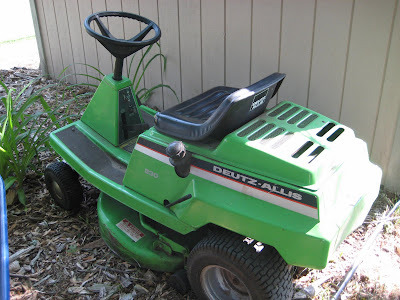 I pulled up craigslist quick, and wouldn't you know it, someone posted a lawn mower just that morning! It was a 42" 2001 Craftsman rider for $425. So I shot off an email and included Tony's phone number. Within a minute we had a call. Guy was about 45 minutes away from us, but for that price we didn't think twice. So we grabbed my Dad's truck, made the treck, pulled $425 out of an ATM and sped away with the final words from the seller, "Yeah, after I got off the phone with you guys I had atleast 10 emails, makes me think I put it too cheap! Heh?" Lol, what were we supposed to respond to that?! By 2:30 we were on the way to the family reunion. Before, a hand me down, that we were extremely thankful for last year! I vote for a) wife of the year. What a find! I am addicted to craigslist!! It's a confession and I have come to grips with the truth. :) It's fantastic! Thanks for the feedback on my "drinking" blog...haha. A lot of people say I have an "old lady's" outlook on certain issues and that being one of them. I am not the least bit ashamed though, it's worked out just fine thus far. I'm going to add you to my "blogs I read list"!